tackling Lithium-ion battery fires the other day that said "don't smother the buggers", or words to that effect. The smooth talking darling of the US business world, Elon Musk can do no wrong and apparently can walk on water, turn water into wine etc? Aren't Tesla fans (as opposed to EV Fans) getting close to worshipping him like Apple users and Steve Jobs? Before anyone asks, I do drive an EV just not stupid enough to pay Tesla prices (the Model 3 may change that). Not quite sure what your problem is, but this is only news because it is a Tesla. The whole issue with EV accidents and battery power discharges is not exactly new, and your own EV happens to have the exact same problem. Tesla even has pages online with instructions for first responders in local languages, so even in Dutch. Well, not if the batteries are not arrayed across the floor pan. if they are in the trunk/boot or under he hood/bonnet there is a reasonable expectation that the batteries will be better protected in a crash (probably wishful thinking on my part) and will stay in place while the rescue team is working. The Tesla's innovative layout poses some special concerns. But your point about a lithium battery is a lithium battery is well taken. "if they are in the trunk/boot or under he hood/bonnet there is a reasonable expectation that the batteries will be better protected in a crash"
You mean when they are in the crumple zones? the parts designed to be utterly destroyed in a crash to prevent impact from travelling to and encroaching into the passenger compartment? "The Tesla's innovative layout poses some special concerns." You mean having the batteries well inside the crumple zones, in the area of the car specifically designed to avoid having to absorb the impact from an accident, because it also happens to be where the occupants are? Just to be clear, car safety these days involves sacrificing everything ahead of the A pillar and behind the C-pillar (that is, the front and rear screens) so that the passenger area has less force to deal with, and thus the passengers have less force applied to them. Putting the batteries in the bonnet or boot areas, the areas most likely to be utterly gibbed during an accident, is a crazy idea. Even petrol cars usually have the petrol tank inside the crumple zones for this exact reason. Wednesday 7th September 2016 23:03 GMT Sorry that handle is already taken. ...beyond a certain point, physics will always win. Even petrol cars usually have the petrol tank inside the crumple zones for this exact reason. I meant 'inside the area protected by the crumple zones', of course, but I'd hope that was clear from the context. On my car, the tank is below the rear seats, for example - which sounds crazy, but if you think about it, if an impact is so hard it warps the chassis badly and far enough in to damage the fuel tank, then we return to my original comment above - you're probably going to be dead from the impact long before the fire gets you. Re: how heavy the impact...? The fun time for battery damage will be the first time a crotch rocket T-bones one at speed. I've seen passenger shells sliced almost in half. Technically the force will remain the same, but the IMPULSE, (force exerted per second), is reduced on the passengers. No, I mean what I actually wrote, explicitly. The Tesla's batteries are in the floorpan which is anything but "inside the crumple zone". Two Tesla fires that I can remember came about because of the road contacting the floorpan at speed. No crumpling was involved, but there was plenty of burning. The crazy idea you seem to feel is worse than sticking sheets of lithium under the seats is the way other manufacturers are doing the trick. The reason the Tesla isn't is so that the car has some luggage space, a problem with those other vehicle designs. Tesla is also enabling people to drive much faster than people do in those other designs. Which is why they need that proximity-triggered "Yeehaa!" klaxon. Stevie, I'd suggest you have a look at accident statistics and see how many are frontal and side impacts, and how many involve the central underside of the car getting extensively damaged. The fact that you can only find two fires out of all the Teslas on the road (especially given the huge publicity any major Tesla crash gets) suggests that it's really not a major problem. How many others would have had fires if the batteries were in the boot or underbonnet area, where the vast majority of impacts occur? It's not a massive stretch of reality to suggest 'rather a lot more'. The Tesla battery pack is surrounded by chassis rails in the (beefy) sills, and the crumple zones in the front and rear, with a titanium skid pan underneath (a result of one of the fires, actually) - something you won't find under most petrol cars, I might add. It's about as safe as it can be made while still having headline grabbing performance and a range comparable with a similarly performing petrol car, in short - and generally safer than most petrol powered passenger cars thanks to not having a massive lump of metal in the front that's difficult to build crumple zones around. You can never have an entirely safe car, regardless of energy source because that energy source will always have to be very high capacity and will always be a volatile problem in an accident. So you mitigate the risk as best you can; by having the power cells away from the areas most regularly damaged in the vast majority of all accidents - the front and rear and the extremities of the sides of the car - you mitigate the risk for vast majority of all accidents. You can't stop physics if you go sideways into a tree at highway speeds - nothing can - but at that stage, your chances of survivability are going to be slim no matter what the power source - and if your out cold from physical shock and the car starts burning, whether it's LiPo or petrol/oil/ATF that's burning, you're pretty fucked regardless. If you put the energy source in the boot or under the bonnet, you are exposing them to the danger zones in the vast majority of accidents, be they low or high speed - and significantly increasing the chances of unnecessary fatalities due to an out of control LiPo fire in significantly 'smaller' incidents. But LiPo is the best we've got for now, and I doubt we'll ever have a battery source with that much power that isn't a bit 'interesting' when destroyed. It's not risk removal, it's risk mitigation. Your plan of having batteries in the boot or underbonnet area significantly increases risk in all situations except those where there is a (very rare, statistically) serious underbody strike hard enough to literally rip through the floorpan. Teslas plan mitigates risk for the vast majority of situations where someone bashes you from the front, behind, or t-bones you. That's why I pulled you up on that point - other manufacturers are putting their batteries in the boot or the seats or wherever because they are working with existing floorpans that don't have space for it in the chassis, not because it's inherently better. "The crazy idea you seem to feel is worse than sticking sheets of lithium under the seats is the way other manufacturers are doing the trick. " Most of them are putting the batteries in the floorpan. It keeps the CoG low. The only ones who aren't tend to be conversions of existing bodyshells. "But your point about a lithium battery is a lithium battery is well taken." right, lithium being the second most chemically reactive substance in the known universe, and the most reactive of all of the metals. This makes it a very good battery material, not so good on safety following a catastrophic failure to contain the material in an airless environment, nor prevent an unintentional extermely-low-resistance circuit from forming between the + and - terminals following such an event. We've already seen battery troubles on the (I think it was) 777 airliners causing a fire. We all know that on occasion a malfunctioning LiPo or LiIon battery can burst into flames, destroying whatever equipment it's mounted in. We also have airline regulations preventing the shipment of batteries 'over a certain amp-hourage' in airline carryon. Such regulations require that these batteries be shipped in approved containers, fireproofed, etc..
What's next, "unsafe at any speed" for the TESLA? Or do we build fireproofing material and special 'crumple' things for the batteries? Sorry, Lithium is neither the second most reactive element nor the most reactive metal. One of the problems you have in a charged LiPo is the stored energy in the cell which complicates handling a fizzing or popped cell even if not currently burning. Better hope your protection electronics are in good shape if you ever try charging a fully discharged LiPo battery. This battery design is riddled with the most gotchas of any so far commercially available. When delivered in a "lightweight" configuration we are basically talking a fire waiting to happen. Aside: My dad used to teach industrial electronics at college level. He came home one night to report that a discharged Duracell Alkaline AA battery (then a fairly recent innovation) had been sitting on his lab eye-level shelf when it spontaneously exploded. His students changed their trousers, then theorised an internal short, but thereafter he had them swap out the batteries on the instruments before they discharged beyond a certain point. Student eyeballs were two a penny it was true, but a decent multimeter was hard to replace. I call total BS on the discharged Alkaline AA exploding!! Lithium being the second most chemically reactive substance in the known universe, and the most reactive of all of the metals. You clearly have never worked in a chemistry lab or a machine shop dealing with magnesium or titanium alloys. Bulk metallic lithium is pretty benign as chemical reagents go: you can safely handle it in air for fairly extended periods of time (although you most definitely do not want to store it in air). It is also not that easy to ignite, and its reaction with, say, water is only mildly violent. Lithium fires are also not that hard to deal with: they can be extinguished by sand, dry-powder extinguishers, or alcohol-based foams. Magnesium and titanium fires are much, much harder to extinguish: once ignited, titanium will happily continue burning in carbon dioxide, nitrogen, water, sand, and asbestos. There literally millions of chemical substances which are either more reactive or more toxic than lithium, and quite frequently both. I remember seeing a potato-powered clock. I wonder if EV safety could be improved if they were to run off a bag of spuds in the boot. I wonder if EV safety could be improved if they were to run off a bag of spuds in the boot. You might get an electric vehicle to move if it's not much heavier than that sack of potatoes. Better to turn them into alcohol and use that as fuel for an IC engine. Better to turn them into alcohol and use that as fuel for an IC engineyourself. Why go through the trouble of growing potatoes then turning them into alcohol if not to enjoy the primary benefit? right, lithium being the second most chemically reactive substance in the known universe, and the most reactive of all of the metals. "right, lithium being the second most chemically reactive substance in the known universe, and the most reactive of all of the metals." Err. No. Lithium is the least reactive of the Alkali metals (Group II); in this case reactivity increases as you go down the group. So Caesium would be the most reactive of these metals. Cars crash. People die in car crashes. In this case, a man has, tragically, died in a car crash. That is all we know. Actually that's not all we know, we also know that Tesla is working their damn hardest to reduce the number of people that die in crashes, and it's only because of that, that every crash in one of their cars gets reported round the world. If they were just another OEM pumping out dino-powered boxes, you'd hear, and think, nothing. How many people do you think have been killed worldwide in accidents by hitting stationary objects in their perfectly normal cars today? And yet you want to have a go at bashing them. Well, good for you. "In this case, a man has, tragically, died in a car crash. That is all we know." Oh, we know a lot more. It took 5 hours before the fire department finally could start to remove the body. It's also not 100% sure yet if the man actually died during the crash or after because... As it turned out the safety system which should have done a total shut down failed, due to the crash (ironic in my opinion), and because the batteries of the car had caught fire the fire department feared risk of electrocution, therefor couldn't do much. As such it took them 5 hours. I do agree that you can't blame Tesla here, though the failed failsave sounds peculiar to me. However I do think people might want to re-consider driving electric cars considering the extra hazards it could cause. If this had been a normal petrol car then the fire department could have acted a whole lot quicker. and the fire services would have to react far more often - petrol cars have a far higher chance of catching fire than electric ones. Dunno. I personally think the actual recommendation should be to drive in a way that allows you to avoid perfectly stationary trees, mainly because reasonably sized trees tend to win, irrespective of what propulsion you use. Using that strategy, I have managed to drive close to 4 decades without ever having to worry about trees. Tesla has posted some rather impressive crash test results, so I'm not convinced you can class them as unsafe. Given that Tesla now reports, via AP, that the driver was doing 155km/h* (nearly 100mph for youse non-metric types) prior to the crash he was either unaware (unlikely) of this recommendation, temporarily unable to heed this advice for any number of reasons, or he decided to throw it to the wind..
BTW, I do worry about trees next to the road, but rather in a way that makes that I'm aware of their presence and not having cause to meet them through other events. * if correct, that's nearly twice the speed limit for that road. Trees are actually helpful in some accidents, I once had to use one as a ground anchor to attach a winch to when I was working as a breakdown mechanic and had to extricate somebody's car from the ditch that they had driven it into. > However I do think people might want to re-consider driving electric cars considering the extra hazards it could cause. People may well but people are not as rational as we like to believe. Are you considering the additional deaths from NOx emissions or do we feel like externalising those? Not to mention the bakery of bunnies, kittens and unicorns that are the oil producing regions that get subsidised. I would have thought that not having a massive block of incompressible cast iron or aluminium in between you and the other object limits the amount of energy that can be absorbed by the crumple zones when compared to an empty void. That increases survivability in such other cases. I would have thought that not having a massive block of incompressible cast iron or aluminium in between you and the other object limits the amount of energy that can be absorbed by the crumple zones when compared to an empty void. I think you have that the wrong way round. With that massive block of incompressible cast iron or aluminium, an impact that displaces the front of the engine will displace the back by more or less the same amount (give or take the deformability of mostly bolted on stuff). With a bonnet holding separate bits of gear such as boxes of electronics and the ventilation/aircon system for the passenger compartment, you can design the front crumple zone for optimum energy absorbtion; any incompressibility of the bits in it is way less relevant. > I think you have that the wrong way round. Yes I do. Ended up with an extra not in that sentence which changes the meaning. Also, autocarrot changed one of my words to bakery which reads pretty random. But I think you picked my basic point; that if your engine bay contains an engine block, you have to try to jettison it under the safety cell. But it is still going to crush your feet on the way through because you can't quickly change the direction of many hundreds of Kg. The more energy that can be absorbed in front of the safety cell, the slower the rate of deceleration experienced by the passengers. But the engine is held to the frame by three or sometimes four bolts, which are designed to shear in a crash. The (red hot) engine goes under the car (usually, there are some howler designs that push it up through the bonnet so it can come through the windscreen and land in the driver's lap), directed there by the slope of the firewall. Designs with a conventional gearbox will hopefully dislodge the rear axle or the assembly may attempt to come up through the tunnel cover for a hug. You don't want solid stuff in the way. The point of the crumply stuff is to streeeeeeeeetch out the time it takes to go from "Yeehaaohchrist!" to zero and thus reduce the force experienced by the occupants (F=ma, a=dv/dt so for a given dv the dt needs to be as long as possible to minimise F). That's why seatbelts are stretchy and airbags leak. Interestingly, the telescopic steering column is a different case. It collapses because before they did that it was not uncommon for crashing drivers to be killed by a kung-fu punch to the chest by the steering wheel. Then the sun visors and dashboards had to become soft because with no wheel holding back the driver his/her head was free to hit them. The old plywood sun visors were first to go, followed by the wooden dashboard. And so was born the Nanny State, where a person was no longer free to trepan themselves on the visor or do some amateur dentistry on the old instrument cluster. Now, of course, the only serious threat to most drivers is the danger of having two small trumpets cold-stamped into their temples when the air-bag deploys and blows off the horn push. I'm not sure if the Tesla uses LiFePo4, but they're likely using a variant which is similarly stable. You can optimise for stability or power density, and car batteries are typically optimised for stability - these are not the explode-in-your-pocket cellphone batteries. If you need convincing, This video is worth a watch, if only for the bit where the guy unloads a gun into the battery. He doesn't even have a high-vis vest on, try doing that in Europe. It's from Sinopoly, one of the largest manufacturers of LiFePo4 cells. I'm not sure if the Tesla uses LiFePo4, but they're likely using a variant which is similarly stable. "Lithium nickel cobalt aluminum oxide battery, or NCA, has been around since 1999 for special applications. It shares similarities with NMC by offering high specific energy, reasonably good specific power and a long life span. Less flattering are safety and cost. Figure 11 summarizes the six key characteristics. NCA is a further development of lithium nickel oxide; adding aluminum gives the chemistry greater stability. High energy and power densities, as well as good life span, make NCA a candidate for EV powertrains. High cost and marginal safety are negatives." "It took 5 hours before the fire department finally could start to remove the body." I will hazard a guess that the fire department might have tried harder had they been sure the man was still alive. Otherwise, they were correct in being safe. The man was not going to get any deader. Another post, while the thread is more or less 'done', but even so... Usually the aftermath is just as important (if not more) than the moments shortly after the event itself. "And yet you want to have a go at bashing them. Well, good for you." Well, no bashing from me, but in the aftermath of this incident Tesla has shown to have very little consideration for the drivers family. Which I think is appalling. Here's the problem: while the police were still busy investigating the crash and had not given any official statement yet Tesla considered it necessary to send out a press release in which they declared that the driver was speeding together with other information involving the crash. Before the police had given any official reports, even before the police had a chance to contact the next of kin. In my opinion Tesla only had their own reputation in mind here and apparently couldn't care less about the drivers family. Who got to hear some details first from a company's press statement before being contacted by the police. I think that's disgusting on the part of Tesla. They could have waited a week or so before releasing this but no... Their reputation obviously came first. So yeah, you still think they're doing everything they can to keep people safe? Or are they doing everything they can to preserve their own reputation? WTF ? Tesla talked about the technical stats of the accident, they did not say John Doe was a silly wanker who drove too fast and bent the car around a tree. So, you basically also want journos to remain silent on the crash up-until the police have finished their investigation, the next-of-kin has been informed etc ? Have you heard him give a presentation before? or least stay afloat for the while before you catch fire in a really pretty colour. What are the differences, in terms of firefighting, associated with tackling a Tesla compared to, say, a milk float, mobility vehicle, or whatever? I would have expected a fire service to have standard operating procedures for dealing with RTCs/fires for such vehicles. I agree. I mean, they are firefighters, how would they tackle an electrical fire in any other situation? Why didn't they just use the already-existing steps to tackle electrical fires? It's not as if a Tesla car is anything special in that regard. > how would they tackle an electrical fire in any other situation? Why didn't they just use the already-existing steps to tackle electrical fires? It's not as if a Tesla car is anything special in that regard. It's a fairly non-standard electrical fire. First, it's high voltage DC, not AC, which makes it more dangerous. Secondly, there is no way to isolate it (as they would at sub-station fires etc). Third, it's on fire (the electrical source itself, not just stuff around it), and it's got lithium in it. Fourth, there was no danger to anybody by letting it burn (bearing in mind the driver had already died in the crash), so that appears to have been the safest way forward. Not sure what else they should have done, really. Seems like they acted very sensibly. If the Roadster is connected to a charging device, DO NOT use water to extinguish a vehicle fire. Exercise the same precautions used when AC power supply potential exists. If the Roadster is NOT connected to a charging device, Battery Pack voltage will not follow water back up a fire hose. If fire or smoke is observed when the Tesla Roadster is connected to a charging source, immediately shut off power to the charging source. In the case of burning lithium-ion fires, generously and continuously flood the area with water. The water may not extinguish the fire, but will cool the adjacent battery cells, control the spread of the fire, and prevent the fire from being re-ignited. Firefighters should wear self-contained breathing apparatus. Battery cells may emit potentially hazardous organic vapors if exposed to excessive heat, fire, or over-voltage conditions. These vapors include HF2 oxides of carbon, aluminum, lithium, copper, and cobalt. Additionally, volatile phosphorous pentafluoride may form at temperatures above 230o Fahrenheit. Under normal conditions, the Tesla Roadster’s battery cells are hermetically sealed. Contents of an open (broken) constituent battery cell can cause skin irritation and/or chemical burns. If materials from ruptured or otherwise damaged battery cells contact the skin, flush immediately with water and wash affected area with soap and water. For eye contact, flush with significant amounts of water for 15 minutes and see a physician immediately. Avoid inhaling vented gases. If a chemical burn occurs or if irritation persists, see a physician. "These vapors include HF2 oxides of carbon, aluminum, lithium, copper, and cobalt. Additionally, volatile phosphorous pentafluoride may form at temperatures above 230o Fahrenheit." May I just say "Oooh f@ck!" @AndyS Where's the return path? The manual specifically states that it's safe to use water any time the vehicle is not connected to an external supply. Next issue: It's already isolated to the confines of the vehicle. The only possible danger is coming into contact with exposed wiring and the chassis simultaneously. If there's a short to chassis the battery manager should have already fully isolated the battery. furthermore If it's physically disrupted, chances are good it's already open circuit. Even cutting a live wire is mostly a non-issue, except for what the sparks might ignite before the BMS cut in. Perhaps a magnetometer in the "wa-wa" wand they already have to see if an AC cable is live. Confronted by a relatively small hazardous materials fire they acted like a bunch of nervous nellies. They could have worn their waterproof rubber boots along with their insulated gloves. And often their coats are a bit waterproof/insulated. So no problems doing a close inspection at least. Which is probably what they actually did. Its not as if it was a full out dangerous goods spill even with all the Li. Mines the one with the bromine tank in the pocket. The problem is that #1 is quite hard to do when your power source (ie the battery) is wrapped around a tree and is currently on fire. "they are firefighters, how would they tackle an electrical fire in any other situation"
well it's not entirely an electrical fire. What we have here is a case where there is a class 'C' fire _AND_ a class 'D' fire. Putting dry chemical on lithium will probably make it WORSE. Also dry chemical is conductive, and so it would make the electrical fire worse. CO2 usually works best on electrical, and probably the Lithium fire as well. Problem with class 'D' is knowing _exactly_ what chemicals will put it out, and what chemicals make it worse. You could actually put some fires out with OIL, if you think about it, because it has excellent smothering and cooling effects, so long as it's not atomized with plenty of O2 [in which case you'd get an EXPLOSION and a class B fire to go with it]. Class D fires may be self-oxygenating. in the case of a LiPo, this is probably the case when you get past a certain point. Li reacts with just about everything, from the negative electrode to the material it's sealed up with, the atmosphere, WATER, and anything else you throw at it. When I was in the Navy I was trained in firefighting [as everyone else was] and we did regular training and drills and whatnot. I've actually put out a couple of fires (not while in the Navy) when there was an arsonist in my neighborhood, a few decade ago. I wouldn't call myself an expert, just 'knowledgeable'. Re: facing old demons in new guises. Remember the AIDS panic of the 80's. First responders were arguably worse than the public in their clueless behaviour. I mean, they are firefighters, how would they tackle an electrical fire in any other situation? By making sure the power gets shut down. Why didn't they just use the already-existing steps to tackle electrical fires? It's not as if a Tesla car is anything special in that regard. Because the safety system which should have done a complete shut down had failed due to the crash, therefor the risks of electrocution were still there. Also because some of the batteries had caught fire. I think the procedure is to say a mass. No, it's spilt milk. SOP is to cry over it. Milk floats and mobility scooters tend to have lead-acid batteries, and (I think) relatively low voltages. It's the high voltages present, and the nature of lithium batteries, that cause the problem in a Tesla Model S sports car crash. I'm thinking that not a lot of mobility scooters burst into flames after hitting a tree at highway speeds and trap the rider inside the wreckage. I believe that it's not the voltage of the battery that is the primary concern, but the energy density of the cells that compose it and the failure modes of those cells. A lead acid battery has a relatively low energy density under most conditions when compared to a lithium battery, and a very sturdy housing (but can still weld a spanner across its terminals if you are a clown when handling them and may explode as the electrolyte boils when that happens) but the Lithium batteries used in EVs have an extraordinarily high energy density which is barely contained by the housing. When a lead acid battery fails it may include a fire. When a lithium battery fails it almost always includes a fierce fire comparable in visuals to an Estes solid fuel rocket motor. Lithium batteries also have many more failure modes that are potentially fire-causing than a lead acid accumulator (though I just had a lead/acid gel battery that when connected to a UPS - which turned out to be faulty - got so hot I sustained a serious burn while disconnecting it).over-discharge, over-charge and physical damage will all cause fires (in the case of over-discharge, when the charger is next connected if it doesn't include the necessary circuitry). A lead acid battery will typically survive such conditions without catching fire, though it may not work ever again if you boil off the electrolyte or punch a hole in it (all been done in my sight by the way). Lead acid gel batteries have different issues but again rarely catch fire (though I've seen one burst). "A lead acid battery [...] can still weld a spanner across its terminals if you are a clown when handling them and may explode as the electrolyte boils when that happens"
I don't know about you, but I would buy tickets to see that. Just what I was thinking. The headline is a bit click-baity, but the gist is that this is unusuaul, and the fire brigade were unsure. One assumes the firefighters wear gloves, and if part of the battery and been ejected already, the risk was low - lower than, for example, a fire under the petrol tank of a conventional car, for which, no doubt, the firefighters will have procedures. Though having said that, in response to a post above, this conjecture does feel a bit like defending Musk's reality distortion field. You think "Tesla driver dies after Model S hits tree" is clickbaity? Genuinely baffled. Clickbaity would have been something like "Electric car smashes into tree, killing innocent driver in grisly fireball - was robot autopilot responsible?" Some stories call for light-hearted headlines. This is emphatically not one of them. It's presumptuous. Until the PM the sequence of crashing and dying is unknown. He could have had a heart attack or stroke and died at the wheel. > You think "Tesla driver dies after Model S hits tree" is clickbaity? Oops. no I don't - a mistake on my part. My apologies, and I should have checked. What I meant at the time, and should have used the 10-minutes edit for, is that the description of firefighters not wishing to approach the car seemed rather overly-dramatic. "Clickbaity would have been something like "Electric car smashes into tree, killing innocent driver in grisly fireball - was robot autopilot responsible?" "Robot car kills all occupants and threatens emergency services, What it did next will shock you"
That right there is an electrifying headline. You work for buzzfeed don't you? I don't at present, but am looking for a new contract... maybe I should give them a call! Maybe not. Let them come to you; there's no benefit in appearing desperate. While you wait, continue to hone your chops (for which I owe you an upvote). Ever experienced a LiPo fire even a small one? They can do anything from sit and lurk, bend, attempt to swell, emit smoke and steam, burn (nice and hot) with lots of smoke and pretty colours, or simply detonate as they see fit. Also you don't know how many batteries are left inside the machine. Also although the machine that crashed yesterday didn't have autopilot (it seems) none the less it's the autopilot facility that is the reason much more attention will be paid to any incidents with the Tesla product line. Maybe time's less of a problem for milk floats and mobility scooters, and the fire service can afford to wait for it to burn out or the manufacturer to show up. After all, it's not like a milk float really goes fast enough to "plough into a tree". So you're less likely to have a trapped/dead person inside. I've no idea really; this is speculation. But as a potential EV buyer myself, how the emergency services deal with them is something I've wondered about. Older vehicles tend to use other battery technologies, normally Sealed Lead Acid, which are much less prone to self-combustion if damaged or punctured compared to Lithium Ion. “If the car was on four wheels, the fire brigade normally has no difficulty to turn off the batteries. However, this car is completely destroyed, hampering the recovery. In this situation, you never know what can happen.”"
Sealed or not, there is really no fire risk on Lead Acid powered vehicles such as a traditional milk float. The sulphuric acid is dangerous but easily and quickly diluted with water. The biggest danger is the sheer mass of each battery pack. The sulphuric acid is dangerous but easily and quickly diluted with water. Are milk floats still electric? I'm sure there's one that came down my road that sounded very much like an 18-wheeler's diesel engine. Uh, what's a 'milk float'? Actually, being a 60s kid, I know, but my kids wouldn't have a clue: some kind of cocktail, perhaps? "Warning: Handling a submerged vehicle without appropriate PPE can result in serious injury or death." Re... Uh, what's a 'milk float'? A thin milkshake with a scoop of ice-cream on the top, I believe. Depends where you are. My area has milk floats (electric) for the town, and flat bed transit diesels for the out lying areas. Generally those things use lead-acid batteries and so aren't so problematic since the energy density is much lower. When it comes to Lithium Ion, we're talking a much higher energy amount in a more volatile package. That said, surely people have smashed prius' up this badly before? You'd've thought they'd have come across something similar before. Well, partly. Also the contents of lithium packs are more reactive than almost any other kind of cell and the outer package less robust because it's lighter. NiMH can achieve close to same order of Energy per unit volume, but is very much heavier and less reactive. Lead Acid is very much heavier and once the sulphuric acid runs out they have no energy, in that sense the liquid types are "safer" than the gel types, which still can start a fire in a short circuit when ruptured. Sulphuric acid is bad on your skin and terrible in your eyes, but it's not very concentrated and easily diluted with water. Water can be really bad on ruptured lithium cells. Well not for nuthin' but my years in the lab at Climategate University, (East Anglia) proved time and again that even the concentrated form of Sulphuric Acid gave me plenty of time to get to the tap to wash it off, and I had terrible eczema at the time which made my skin super-sensitive*. Absent a nearby water supply I suppose you'd be in trouble eventually. Eyes are a whole different class of problem, as is ingestion of course. I stand by what I said about the relative safety of lead acid batteries, the automotive iteration being engineered and over-engineered to be robust under a welter of adverse conditions that would have a Lithium battery "venting with flame" (actual language from manufacturer's fact sheet). About the only thing you can do to endanger your life while handling one is to short the terminals, then not notice. Internal shorts are rare with a car-type lead acid battery because under the heavy load a starter motor puts on one the plates actually try and move to touch each other, and so are separated by non-conductive baffles. I used to have a see-through Lucas battery of the type, and it was an education to use and charge it, I can tell you. * I did get a nasty skin burn off concentrated "nitrating mixture" when the bottle spat at me once in that same lab, but they don't put that stuff in batteries, thank Tesla. "surely people have smashed prius' up this badly before?" At the end of my street there is a minicab company that uses Priuses, and I confirm this is true. It seem plausible that the tesla's crash speed was considerably greater than the maximum speed attainable by a Prius or similar car. The lack of standardisation is indeed an issue insofar that it's new tech, and batteries are still rather unpredictable (as Samsung recently discovered). As soon as you get plate-forming in a cell you have short circuits and a heck of a lot of energy that wants to go somewhere, which is when it gets hairy for a first responder - not sure if cells are sufficiently isolated to contain anything to just one cell. With a combustion based car it's more a matter of laying down some foam over wherever fluids leak out, which is not an option for batteries. This may be worth separate safety tests because this has to be worked out one way or the other. Maybe mandate some sort of giant sticker "cut here" where you can rip out a master link, but that still doesn't deal with busted cells going quite literally ballistic.. The manuals have those "cut here" instructions. My concern would be the fact that there is only one site to to do the cutting. A poor presentation might render it inaccessible. Another kill loop in the charge port would be a good idea. Or for that matter, why the <blank> doesn't the battery self disable in any situation the airbags deploy? Even better, consider that every single cell in the pack is individually fused with a fairly fragile wire link. Now i realise 8000ish(?) fairly fragiles adds up to something substantial, but it still should be possible to design the battery frame to deform on impact in such a way as to snap or sheer those fuses and electrically isolate every last cell. Erm, a milk float, golf buggy, mobility scooter operate at around 12-50VDC and generally used lead/acid batteries. The Tesla (and other EVs) have much higher voltages and the batteries are rather prone to spontaneously combust, like the recalled Samsung Note. Not without a rocket sled and a couple of gallons of petrol. If the milk floats were the only vehicles on the road then you might have a point. But the milk float need not be the vehicle that causes the high speed collision, I'm pretty sure that milk floats have been hit by cars and trucks in high energy accidents and can, therefore, suffer serious damage equivalent to a Tesla hitting a tree. Apparently the best advice available is just to let it burn itself out. Oh my. ...have done for millennia, apply as much water as possible. If you know how alkali metals, of which lithium is the lightest example, behave when immersed in water this might seem counter intuitive. There are plenty of explosions on YouTube to entertain if you don't. However, it's the least reactive, of those metals, and even a radically compromised cell is only going to present a relatively small reaction surface. The sheer mass of water from a firehose will eat that amount of heat for breakfast. And unlike a with live cable being fed from a distance, there is no risk of a ground return. A water short here is a friend, since it will simply discharge intact cells, taking them out of the equation. The problem with applying water is that once you start you have to keep going until every last scrap of exposed lithium is reacted and gone, or a runaway reaction becomes possible as the mess dries out. Hence the wait for an hour after last heat signature. To give the water a chance to seep into any nooks and crannies and restart the fire. A water short here is a friend, since it will simply discharge intact cells, taking them out of the equation. Erm, quickly discharging one of those cells will release all the energy present in it, heating the cell and whatever it's shorting it. Now consider there are a bunch of those cells in a more or less enclosed space. As said elsewhere, it's not metallic lithium you're dealing with (holds for all types of Lithium rechargeables; only primary cells contain some metallic Li). It's a packet of energy that wants to go somewhere, and is capable of doing so vigorously which is, in essence, the problem. "The sheer mass of water from a firehose will eat that amount of heat for breakfast. " 1. Possibility of hydrogen accumulation and spark ignition, since it's a vehicle and not an open dump. 2. Water from a fire hose may simply scatter lumps of lithium a considerable distance, leading to later hazards. 3. Water on its own will not discharge intact cells as the current flow from a 4V cell into ordinary tap water is tiny. You would end up with the possibility of scattered lumps of lithium starting fires as they dry out, and an unknown number of undischarged cells. Along with a lot of water. I assume milk floats etc run on much lower voltage, and probably just lead-acid batteries, which have been around a lot longer (and are much less dangerous) that lithium batteries. I also know that the London Fire Brigade have had extensive special training for the 650V hybrid li-ion powered buses churning around their streets, with packs that make Teslas look like matchbox toys. I wouldn't like to be in or near one of them if something hit it hard. Since it's been stated that the driver had already died before they were on scene, I think they probably did exactly the right thing, tragic and awful though it is. MIlk floats, mobility vehicles or even the death traps on wheels like G-Wiz are lead batteries. Most hybrids are NiMH. It is only now that the newer vehicles have LiPo batteries and I am not surprised that Joe Average Fireman does not yet know how to deal with it. There is emergency response software that shows the extrication procedure for any car. It shows where to cut it open, where disabling wires are, and hazard areas. I found Tesla's Emergency Response Guide online so it should be there. I'm not sure if the tree knew about those instructions. Judging from available images, it probably didn't, and I can't blame the fire brigade for being hesitant because of that. "What are the differences, in terms of firefighting, associated with tackling a Tesla compared to, say, a milk float, mobility vehicle, or whatever?" - 385volts vs. 48volts. The voltage is not the most important thing. From an electrocution point of view there is a difference between SELV (Safety Extra Low Voltage), ELV (up to 50VAC/120VDC) and low voltage (up to 1500V maximum excursion, i.e. 1000VAC and 1500VDC). SELV can sustain an arc under suitable conditions, and I used to have the melted spanner to prove it. Lead acid vehicles and telephone systems are almost all SELV, but even so they can produce hazards; lack of ventilation can result in hydrogen explosions, for instance, and the Boat Safety Scheme expects conductors connected to batteries to have (I think) a minimum of 25 sq mm cross section to prevent shorts from setting everything on fire. On the other hand, a domestic 230VAC supply with RCBOs is pretty damn safe even though it can deliver nearly 10kW on the cooker circuit, whereas a 48V battery circuit driving a 10kW motor at around 200A requires considerable knowledge to design for safety. Electrocution can occur with SELV under wet conditions. It is all about standardised design, familiarity and training. Lots of people have been looking at electrical safety since Kipling described early electricians splicing live wires, but large lithium batteries in road vehicles along with all the electronics and electrical machines are very new, and the body of knowledge presumably isn't widely disseminated yet. At the moment electric cars, in terms of numbers and familiarity, are something like petrol cars were before WW1, and I imagine fire brigades had a lot of trouble with them. 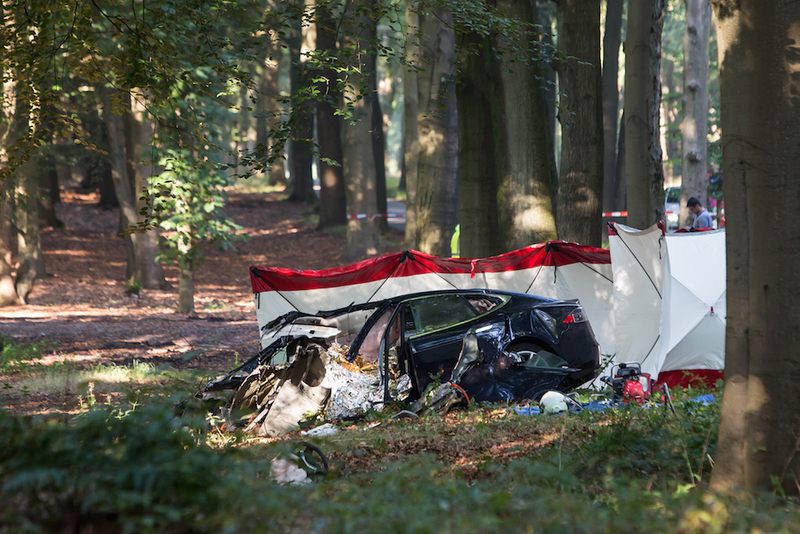 Man dies by driving sports car into tree. How many times a week/month/year does this happen? It's not news, just a statistic. OK, so it was a Tesla. Whoop di do. The driver was already dead by the time the fire brigade got there. This is such a non-story. Re: Where's the news here? Condolences to the friends and family. Death like this is just awful. Sympathy. It's not mentioned if the driver was using Autopilot or not. If he was, then this is a yet another Tesla Autopilot story of potentially monumental proportions. Like government ordered remote disabling, recall and retrofit, possible fines, likely lawsuits. If not, then why didn't the crash avoidance systems at least prevent or reduce the crash to survivable impact? Was the tree confused with the sky? There are tech news worthy issues here. El Reg needs to follow this. Usually it's trees and Mustangs. When the sound of a 302 revving up is heard, the trees begin quivering. Within a minute, one of them will have a Mustang wrapped around it. This was a long standing joke. Then a coworker crashed his "5.0" (sic, 4.9L) Mustang backwards into a tree. Exactly in accordance with the stereotype. The huge tree, starting from the rear bumper, was mere inches from the front seats. He survived. I think that the tree was okay too. You don't just drive a Tesla Model S. Oh no, you pay to be Tesla's crash test dummy. Feel sorry for the poor bugger that died, but people die in car crashes every day. The only reason this is a news article is is people think Tesla death = auto-pilot = reason to bash the technology. There was a good amount of news regarding the Vauxhall/GM Ampera when that kept bursting in to flames. Bursting into flames is fairly common among automobiles that crash into solid objects at speeds that, in this case, appear likely to be over 100 mi/hr - irrespective of their energy source. This is news notable only because it is a Tesla and the attendant possibility the driver was going at such a speed "no hands." If Tesla wasn't built from and valued by so much hype and publicity it wouldn't be a story. Tesla's ridiculous valuation is $620,000 for each car it sold last year. One of the few thousand cars it has built crashing might well wipe millions off that valuation. Also this road does not look like the sort of road where AutoPilot should be used anyway. In UK parlance it appears to be a single-carriageway rather than a wider motorway or similar with crash barriers etc. where I imagine AutoPilot's use-case is based. You would probably not use Cruise Control on such a road in a normal car anyway because of the opposing traffic/trees etc. It's just a learning curve. Imagine the first firemen dealing with a car crash: gallons of highly flammable petroleum just waiting to burst into flames. As electric cars become more widespread, fire-fighters will learn to handle them. Same thing when airbags entered cars, the especially side curtains mounted in the A-pillars and or along the edge of the roof. Firemen were hesitant in where to apply cutters, so as to not set off the gas generators (effectively explosives). This problem is not unique to Tesla, or to other battery-powered vehicles. A similar issue exists for buildings equipped with solar panels: there is no sure way to guarantee that no life-threatening voltage exists within the structure (or a car wreck in this case). See, for example: Rooftop solar panels pose dangers, Ontario firefighters say. Another big difference from gasoline-powered vehicles is that if you cut off oxygen from a gasoline fire (e.g. by covering fire with foam), or drop the temperature (e.g. with a massive amount of water), the fire stops. It will not re-ignite on its own, and the area becomes reasonably safe to work in. With a battery fire (electrical or not) all the energy and all ingredients are internal to the source of the fire, so cutting off oxygen is not going to help. Using massive amounts of water might help for a chemical fire, but might also make things worse if a part of the electrical circuitry is still live. It may also cause an explosion if the material in the battery reacts with water. In that sense, fires in battery-powered vehicles with sufficiently large batteries may need to be treated the same as other self-sustained chemical fires: you let it burn until the fuel/oxidizer is exhausted, while trying to contain the damage to the surrounding structures. This is especially the case if the firefighting crew does not know exactly what is present within the fire, and how it is going to react with their fire-suppression agents. Which was exactly what the responding crew did in this case. Adding water to a lithium battery is a very bad move. My EV manual is plastered with warnings telling you not to let untrained personnel near the internal electrics. Since they can deliver 200A at 300V, that's understandable (and I'm sure a Tesla is capable of a significant multiple of the amperage figures). Using massive amounts of water for a chemical fire is a Bad Idea if that chemical is lithium. Apparently not according to the First Responder extract in the above post above. I imagine that if a particular cell is on fire then that's that - and water won't extinguish it or make it burn any more than it is already doing (although you might get an explosion and molten lithium metal flying around but on its own Lithium does not burn hot enough to melt when reacting with water at least in a lab). See Theodore Gray's website for Sodium doing a similar thing when a large block is dropped in to a lake! Sodium is a row below in the periodic table so will be more spectacular than Lithium. The gist of the advice seems to be that a significant amount of water will dissipate heat from those remaining cells that are not on fire and presumably still in their normal packaging - which is a good thing. Not really any significant amount of metallic Li in LiIon cells. If you want that you need to dig into a Li primary battery (ie non-rechargeable). "...strip the oxygen from the carbon, that's why water doesn't work so well either." So, the fire fighters are rightly worried about electrocution. What about the occupants - surely that must factor into decisions about their safety too ? Rough translation seems to be that if you get into a crash in one of these, then the probability of getting out in one piece is lower. Your choices seem to be a fierce electrical fire (with associated gasses) or electrocution when the fire fighters douse the vehicle in water and now an increased decision time whilst waiting for a call to a helpdesk to assess the risk. I hope they didn't get "your call is in a queue" or the obligatory 2 minute dialogue about calls being recorded etc or worse still "our hours of operation are ...."
Obviously any vehicle will by definition have lots of stored energy on board and any fuel will produce bad gasses when burned, but with a Petrol or Diesel car, they can attack the fire quickly to increase your chances of getting out when things go wrong. It sounds like there is an opportunity here for emergency services training / info packs on the newer cars as obviously electric is not going to go away and power densities will presumably only go up. This isn't a Tesla only issue, but presumably applies to things like a Prius in the same way. Rough translation seems to be that if you get into a crash in one of these, then the probability of getting out in one piece is lower. It might be true that if you do get trapped in one of these then there will be a slightly longer delay in getting you out than there would be for a more popular type of car. Or it might not. We can't tell from just this case whether it takes longer to knock down the fire and cut the electrical link or put out a petrol fire. Even if the electrical fire takes longer we still don't know which is more risky because we don't know the difference in their odds of catching fire in the first place. Worth remembering that on this occasion he was already dead so it was reasonable for the firefighters to delay in order to decide the safest way to deal with it. If he'd been alive but rapidly deteriorating, I would guess they'd have made sure they were stood on something insulating and started cutting anyway. "Worth remembering that on this occasion he was already dead"
Just for the record, what evidence did the fireman have to support their assumption that the driver was already dead at the scene? Particularly since there was a point when the driver couldn't be approached due to the fire? At a rough guess, firemen have reasonable experience in determining whether someone is alive. There may be ambiguous cases. There may be very clear cases. They probably didn't get this wrong. Firemen have a lot of experience with car crashes. And the resulting carnage. Particularly since there was a point when the driver couldn't be approached due to the fire? It wasn't the car that was on fire, several batteries thrown clear of the car from the crash were. The problem concerning the car itself were the batteries still inside, and the potential hazards they might pose. I would guess they'd have made sure they were stood on something insulating and started cutting anyway. That will only help against the case where a hazardous voltage (i.e. 50V or more) exists between the car and the ground. With a crashed car not standing on its four wheels only that's not likely to be the case. The problem, as I expect it was, is that it's very likely that one side of the battery pack is now connected to the car body through damaged isolation, and any wire should be treated as now carrying the full voltage of the pack against the body. With over 300V present you don't want to accidentally touch a frayed wire, and the amperage available will make cutting stuff not the sanest of propositions. It seems that the car it's self didn't catch fire. What did were the battery modules that had been flung free by the impact. The second, and unverified fact is that it was a 2013 model without Autopilot fitted. No, it's spilt milk. SOP is to not cry over it. No, it's spilt milk. SOP is to notcry over it. What happens when SOPs conflict? I mean, if you're a little girl and you spill milk, what do you do? Obvious if you're a big girl. You could always say you were crying over the glass/container and get off on a technicality. Holland is one of the safest road network in Europe apparently, really this is just another car crashing into a tree killing the driver. This normally would only get mentioned in local press if at all. I guess as it is a Tesla it makes for a story. Interesting. I was recently informed that firemen in our neck o't' woods will let any house with solar panels on the roof burn because they are mighty afeared of electrocution. In a conventionally powered house they can cut the breaker at the pole and isolate the home from the grid. Perhaps a new dialog needs to be opened with said firemen on how best to address the issue of not zapping firemen when they want to squirt water on a blaze when new technologies are deployed? "Perhaps a new dialog needs to be opened with said firemen on how best to address the issue of not zapping firemen when they want to squirt water on a blaze when new technologies are deployed?" Just require a cutoff switch before the non-standard input enters the house grid, like how a master breaker works. That way, in the event of a fire, they can just open the cutoff and limit the potential risks. Just require a cutoff switch before the non-standard input enters the house grid, like how a master breaker works. PV installations tend to have one already, either separate or as part of the inverter. Problem is, that's not enough. A single decent panel can output 18V at 10A or more; a PV setup tends to have several panels in series ("strings"), with one or more strings feeding the inverter. If you interrupt the string(s) at the inverter (which may be deep inside the house, so there's another problem in actually finding and reaching it, especially when the house is on fire) there can still be 150 to 250V DC present between the leads of each string. Breakers between every second or third panel and the next in a string might be a solution, but requires a lot of extra cabling to bring each of those points in the circuit down from the roof where the panels are to a point where the fire brigade can see and reach them. I keep saying this about UPS too. Sure, in datacentres and such-like, UPS are well-known and there are procedures but they also have diesel generators and multiple power sources so they are used to it. But how many offices, schools, etc. have a UPS or two spread over the place? It doesn't hit home until have a) a flood, b) a short or c) a lightning strike and then you suddenly realise quite how much power you have sitting in batteries secured behind a flat connector and a large-bore high-current cable. Enough to run your servers for an hour? Enough to run all your switches and critical infrastructure? I made the schools I work in put a sign that says about the UPS on the doors of server rooms. And we have had floods that have destroyed equipment and people just wandered into it and walked around in it with trainers on, while trying to shove it out the door with a metal-handled broom. Nobody thinks of that. Although a UPS is fairly low-voltage, it's certainly NOT low-current, or low-capacity, and they are generally on the bottoms of racks or server setups because of their weight. I wouldn't want a UPS battery to discharge through me in an incident, and I can quite believe they could start fires given half a chance, even with over-current protection, etc. it only takes a drop of water, short or a damaged piece of equipment to create a spark that could kill you - directly or indirectly. Just in the room I'm in at the moment, there's enough battery power to power 2.5KW for several hours. That's gonna hurt if it goes through your shoes. Why would it go through your shoes if it can go through the water instead? It is if you put that low voltage across a high resistance; Ohm's Law dictates the current. If you've got <50V batteries, there really isn't going to be a problem touching a conductor at battery voltage. It might be a little uncomfortable, but it isn't dangerous. This is why film scenes of torture with a car battery are so ridiculous - you can plug yourself into a car battery without even feeling it. The current flowing is very small if the resistance is high. It's when the resistance is low - such as putting a bicycle spoke across the terminals - that you get a high current flow and lots of energy delivered. I'd like to disagree with you here. I understand Ohm's law. A car battery - which is what a UPS is, tied to an inverter - is 12v 400A or more. I guarantee you that you don't want that discharging through you in any way. Being DC, it also provides a handy method to clamp your muscle to whatever it was that you grabbed and not let go. AC will cause your muscles to spasm, DC won't, you'll just clamp on. There's a reason that you don't stand between cars that are being jumpstarted or allow them to touch (and it's nothing to do with hydrogen discharge). Just the tiniest of voltage differences between them - with the right resistance - will send the shock through you and you won't be able to do much about stopping it while it does. Additionally, have you ever seen a battery like that short? They are quite spectacular. My father worked in truck fleet repair for several major breweries (basically every truck delivering beer in London at one point or another). Ask him why he keeps a 2x4 handy and tells people when he's working on a faulty or shorted lorry battery (which may be 24V but that just means it's only twice as deadly). Sure, it's rare. It's unusual. Because most batteries aren't subjected to those kinds of things. The ones that are tend not to live very long. It doesn't mean you want to stick your trainers on and wade through a centimetre of floodwater that has a positive terminal sitting in it. Guess what happens when things like skin get wet? Their resistance plummets. And though the water might boil off your skin eventually that won't be any comfort to you while it's happening. The reason 9v hurts your tongue is because of the wetness, not the sensitivity. Short of biting your tongue, it's hard to hurt it even when extricating food at high pressure from a broken tooth. And deadly current can be as low as 100mA if it goes from limb to limb. Like, say, reaching for the off-switch while your trainers are wet in the puddle that the UPS is sitting in (perfect ground). Rare, yes. But not something to be ignored. It'll hurt, at minimum. On clamp your hand onto the switch so powerfully you can't move it or shout for help. Guess what the 2x4 and a nearby friend is for. A car battery is 12V. The current supplied depends on the resistance across it. A human is of sufficiently high resistance that that current is insignificant. We're not talking about a short - we're talking about a high resistance human being across the terminals. The current is almost immeasurably small. Well then, you go and ask him if he's ever put a finger on each terminal of the battery. It would amaze me if he has not.I've done it many, many times and it has no effect whatsoever. 100mA across the chest will likely kill you. But putting 12V across your arms will not drive 100mA through you. That's Ohm's Lax - V=IR. To get 100mA off a 12V battery would require R=120ohm. That's quite a few orders of magnitude different to a human. From 12V? Yes, something to be completely ignored. If you don't believe me, try it for yourself. If you don't have the spuds for that, sort out the transport and I will come and do it for you. If you think you can get electrocuted from a 12V battery, you do not understand simple electrics. Guess what the 2x4 and a nearby friend is for. Pushing a leaking lead-acid battery out of the way, I should imagine. It certainly has nothing to do with 12V electrics. Since I had the appropriate bits in front of me, I just measured the current that flows when 12V is applied across my wet finger tips, hand to hand. It was less than 100 microamps. "A car battery is 12V. The current supplied depends on the resistance across it. A human is of sufficiently high resistance that that current is insignificant." Maybe you guys are at cross purposes to some degree. Yes, 12V isn't going to let any great amount of electricity flow through a human. However, the current available to a conductor placed across the terminals depends on the total resistance in the circuit. That includes the internal resistance of the battery itself and the internal resistance of a car battery is low. That's why shorts of car batteries can deliver a large amount of energy in the form of dangerous amounts of heat. Forget electric shock - you don't want to beholding the spanner that bridges the terminal. Sadly not. The contention is that a 12V, low internal resistance battery can drive lethal currents through a human body by touching the terminals. You, I, and pretty much everyone else knows this to be incorrect. A car battery is 12v 400A or more. I guarantee you that you don't want that discharging through you in any way. The average person's resistance between their fingertips is several tens of kOhms. Now please apply Ohm's Law to calculate the current through a 12kOhm* resistor, with a 12V, or even 24V source. 1mA with 12V, or 2mA in case of a 24V battery. Any actual danger from an UPS is the AC output and other mains circuitry, same as conventional mains. There has been, AFAIK, one fatality from a 9V battery, when a sailor rammed the probes of his Simpson VOM through the skin on the fingers of his left and right hand, with the current now finding a much lower resistance path through his body's internals, including his heart. * makes for easy calculation, and is way below the average. My own is several 100kOhm, even when sweaty. Large UPS units (like 3 phase DC gear) actually have the batteries connected in series. They frequently give well over 400VDC - with the insane peak current of 200kg of batteries I half suspect you could hook them up to a subway train and have it move. I once brushed against a busbar in one while changing batteries... not fun but no lasting damage thanks to the current not finding a good path through me. Also, even with lower voltages a source that can deliver a high max current can be significantly nastier to work with than a low current one. Even though it won't be able to drive a lethal current through you, if you screw up and cause an arc it will still burn you to a crisp. I'm actually more scared of arc flash than electrocution risk even when working with definitely-fatal line voltage if the feed is fat enough. "A car battery - which is what a UPS is, tied to an inverter - is 12v 400A or more. I guarantee you that you don't want that discharging through you in any way." No. A car battery is 12V & 400AH. Amp-Hours is the unit. That means it is theoretically rated to supply 400amps for 1 hour or 200 for 2 hours etc. Saying it is 400A is like saying the fuel tank in my bike is 400kph, and makes just as much sense. 400Ah is a honking big car battery; most are 40 to 70Ah for family cars, and up to 100Ah for the average van. I read it as 400A current capability, or in car battery parlance, Cold Cranking Amps, the current it can deliver to your start motor on a frosty morning with your engine's content resembling molasses. The UPS in the next room to me has 18 off 12V batteries in series. Given that a 12V battery in good condition is actually 13.6V, it is approx 245V, and not the 12V you describe. The battery pack connects to the rest of it via a 50A fuse. However, there is a complete absence of lithium, and it has yet to reach the speed of a milk float. "...Just the tiniest of voltage differences..."
Human skin can protect you from any 'Low Voltage'. That's why there's essentially zero risk of electric shock from low voltage sources, unless you start inserting terminals into various bodily orifices. The transition is about 70 volts. 12-volt cars, no direct risk. Keeping the cars apart during jump starts may be a hold over from the age of metal bumpers and positive ground vehicles. Modern cars have little exposed metal to rub together. Trucks maybe. Low voltage sources can be very high current capable. High currents can be dangerous if shorted. That's a thermal burn risk, not electrocution. E-cars can be about 400 to 500 volts. And high current. But anyone understanding the basics could work around them safely. First Responders obviously need training and some basic protection gear. Boots, gloves. Easy. We are sometimes dealing with 40kV and then the gloves need to be certified and inspected. 500 volts isn't as tricky, so should be easier. That's just for the electrical side of the problem. EV batteries should also be considered packets of energy (because they are) that wants to go somewhere, and one of the options there is heat. I think if you could lick both terminals on most car batteries, you'd be in another industry! "Watch the tongue, sweetheart. I've seen him lick his eyebrows clean"
This is why film scenes of torture with a car battery are so ridiculous - you can plug yourself into a car battery without even feeling it. But they use a car battery + ignition coil. "I wouldn't want a UPS battery to discharge through me in an incident..."
Don't many UPS units carry ground-fault circuit interrupters? That way if it does get flooded and short to ground, it'll shut off? Honda driver dies after hitting tree. Toyota Prius driver dies after hitting tree. Firefighters afraid of "electricity" from the batteries... Time for some updated training I think! Did you bother to read any of the above? So, still no proximity-triggered "Yeehaa!" siren? So much for "cutting edge technology". The gist of the article is that he thinks Tesla should not be involved (I can see both pro and con that argument), but there's one particular fail: "Er rijden al zeker zes jaar elektrische auto's rond. Van Nissan en Renault weet ik dat de accu bij een crash wordt ontladen, zodat er geen spanning meer op de auto staat". Translated: Electric cars have been around for six years already. I know that with Nissan and Renault the batteries are discharged, so there's no voltage present on the car. Discharging the batteries would release whatever amount of energy was in them, either causing or exacerbating a fire. I suppose he meant "disconnected", and while it might be a transcription error, it appears to be a direct quote. Anyway, with a car (and its battery packs) that damaged the fire brigade may well be hesitant in accepting that battery safety measures did work correctly, and the car is now inert. I think I might stick with driving around with a tank of highly explosive liquid under the back seat instead. I mean, when's the last time a petrol car ever blew up in a blazing inferno? I'm sure that's absolutely never happened. IIRC A car in the early 20th century had superheated steam routed through pipes in the body panels. In a sideways shunt these would rupture - cooking anything within range. Put one lead on the ground and the other on the chassis. If it reads 400+ volts, then back away. If not, then get back to work. Use common sense and don't touch any big fat red wires. PS - if you're wearing rubber boots then the ground return is almost a non-issue. And a thermometer: you want to know whether any of the battery cells has developed internal problems, and is now near the point of thermal runaway. Never mind that for this you need to poke around in whatever inaccessible place (design, and/or state of wreck) the batteries are. We'll assume you all understand return paths and if their is no return path then no current can flow. I've worked on live 450V using just thick rubber gloves (The type you use when working on foul water). I would start furthest away from the damaged batteries and crop the interconnects between batteries and each one you remove the lower the voltage becomes across the circuit. The one or ones shorting I would try if possible with something insulated knock off or free the cable or whatever was shorting it, at least you wouldn't be dealing with 300V any more. Heat is an important issue so if the battery is cooled down it is less likely to explode whilst working on it and the advantage of CO2 extinguishers is they cool down the fire, this could give you the time you needed to just slip a rope around each one and rip them away from each other. "...and if their is no return path..."
Unless somebody possesses something called an 'is no'. Not really practical due to packaging. Safety standards may eventually need to mandate including something like squibs (mini explosives) to destructively cut the battery pack's internal circuits when the airbags are triggered. Or perhaps a big red pull handle available just inside the driver's door. Something that can be yanked by a first responder, of with a long hook. Such E-handles can't be outside, or kids will go around pulling them. There is a transport association called "RAI" which established a protocol in 2009 to deal with electric vehicles, exactly because of the risks. It is that precise protocol the first responders were following. There's no mystery here. The car didn't catch fire, some batteries that had been ejected did. The occupant was already deceased. The Tesla S has one of the best ratings for crash impact out there. If the car went off the road, into a tree, sprayed batteries about liberally and caught fire then the driver wasn't likely to have faired any better in a conventional car. See pictures. Driver was dead. even from that picture. There is nothing remaining of the left side of the vehicle from the front of the bonnet through to the B pillar region. See pictures - Driver exceeding 100Km/h on a road that would better be termed a woodland foot path. Issue here? Were the first responders overly cautious in their response and should they have been more agressive? Looking at those pictures, NO. I'll believe that the responders did what they should have done, surveyed the scene thoroughly, determined that there were no lives in immediate danger, and proceeded according to known parameters. If the determination that the driver was already dead is in question, that is best left to a forensic post mortem. I rather guess that there will be some effort to get one done. If the electrical systems were still alive enough in those circumstances to warrant the F.R. calling in Tesla, that is precisely the correct action. Both the technical people from Tesla need to know, document and fix the issue, and the F.R. folks need to have 1st class technical advise on what to do in future when this happens. Most stunning here is that on ElReg we see so many ill advised folks *debating* the situation. Effectively, they are approaching the event the same way any air accident investigation board would. Personally, considering the way most traffic accidents get ignored, I'd rather have the approach used by the Dutch F.R. team. If that's hyperbole, it's seriously out of place. And if you took the path in the background in this photo to be the road he was on, you're utterly wrong; it's just a path leading into the wood from the road he was on (N415). Which is properly paved, marked, is as good as straight for nearly its entire length with two very minor bends, a set of traffic lights on that stretch, and has a speed limit of 80km/h. Which he exceeded, as per Tesla, by almost 100%. Most stunning here is that on ElReg we see so many ill advised folks *debating* the situation. I see very little of that, mostly with regard to battery chemistry, where it's you just guessing whether it's a LHD car. Which is easily verifiable information, and to save you the effort: all of continental Europe is LHD. It does indeed, but after opening this article I can view the picture full-size. A Twitter link from there has a link to an article stating the case has been closed: Tesla found no technical problems leading to the crash, it's a one-sided accident with a single fatality so no liability to sort out. so if a low volume Ford crashes do we let Ford investigate the whole thing and then let Ford release the results? Wouldn't that be the same as letting GM do all the ignition key investigations and let GM release the findings? Would people find that a little bit shady or at least suspect?